Prime Minister Atal Bihari Vajpayee today launched a new insurance-linked pension scheme for senior citizens and a health insurance scheme primarily aimed at addressing the needs of the underprivileged sections of the society. 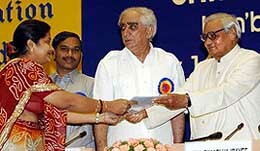 Prime Minister Atal Bihari Vajpayee presents an insurance certificate to a woman as Union Finance Minister Jaswant Singh looks on at the launching of new insurance schemes, in New Delhi on Monday. The investment of General Motor India in the current year has been pegged at Rs 780 crore. From Rs 600 crore invested till December last, the company invested an equal amount during the last six months and proposes to invest another Rs 180 crore by December taking the total investment of General Motor India to Rs 1,380 crore. The onset of a good monsoon in most parts of the country is likely to trigger better fortunes for Punjab Tractors Ltd (PTL). The state government is hoping that with the expected increase in demand for tractors, prospective bidders may come forward with better price to take 23.4 per cent share of the Punjab State Industrial Development Corporation (PSIDC) in the company. Seeking to leverage India’s strength in software, global Internet firm Yahoo ! Inc. is setting up its first R & D centre outside the United States in Bangalore where the focus will be on product innovation and cutting edge technology for the company worldwide. The 84th meeting of the State Level Bankers’ Committee, Haryana was convened by Punjab National Bank, here today. A banner of Boao Forum for Asia conference is displayed in Hong Kong on Monday. 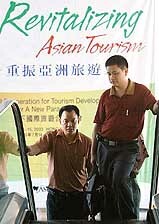 The two-day conference, aimed at revitalising Asian tourism, is the largest international conference in the territory following the lifting of the WHO travel advisory after the SARS outbreak. Can the Maruti IPO story be replicated in other PSUs? 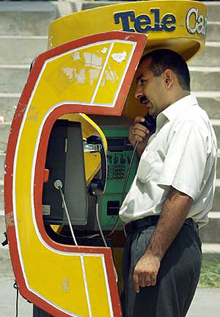 A man uses a public telephone at a shopping complex in Islamabad on Monday. Pakistan announced the opening of its fixed-line telephone sector to private investors on Sunday after abolishing the monopoly of the state-run Pakistan Telecommunication Company Limited earlier this year. HDFC Bank has reported a 30.17 per cent rise in the net profit at Rs 107.28 crore for the first quarter ended June 30, 2003, compared to Rs 82.41 crore posted in the same period previous fiscal. The Supreme Court has directed the power distribution companies here to explain the reason why the national capital was facing load shedding when the power supply was in excess of demand. While the pension scheme is offered by the LIC, the four government-owned non-life insurance companies -National Insurance, New India Assurance, Oriental Insurance and United India Insurance - will run the health insurance scheme. Under the pension scheme, named Varistha Pension Bima Yojana, subscribers will be entitled to a minimum pension of Rs 250 per month and the maximum of Rs 2,000 per month. This will entail a minimum one-time premium of Rs 33,335 and a maximum premium of Rs 2,77,490. The community-based Universal Health Insurance Scheme will involve a premium of Re 1 per day for an individual, Rs 1.50 per day for a family of five and Rs 2 per day for a family of seven. The subscribers will be entitled to reimbursement of medical expenses to the extent of Rs 30,000 towards hospitalisation, a cover for death due to accident up to Rs 25,000 and compensation due to loss of earning at the rate of Rs 50 per day up to a maximum of 15 days. Underlining the need for health insurance schemes, Mr Vajpayee said “elections are contested in many nations on the issues of health and governments change on such sensitive matters”. “In India too, health is an important issue. I am confident that officials of insurance companies and the Health Ministry will discharge their duties effectively and help people”, the Prime Minister said. Stating that the launch of today’s pension and insurance schemes were examples of the government’s commitment to speedy implementation of programmes and policies, Mr Vajpayee asked the Finance and Health Ministries to ensure proper implementation of the schemes. Reiterating the government’s commitment to food security he said “today we are able to provide food to the poor at the cheapest rate anywhere in the world”. 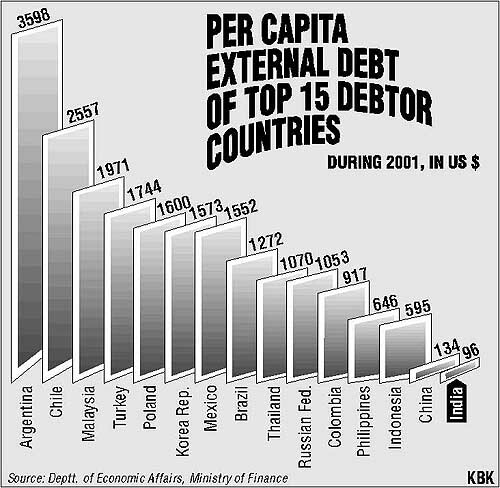 The distribution system of the country could be at fault if there were reports of any starvation deaths. Mr Vajpayee disagreed with Union Health Minister Sushma Swaraj who had observed that old age itself was a “disease” for senior citizens. “Sushma ji ne abhi kaha ki budapa ek bimari hai, main ise nahin manta aur agar aisa hai to hum iska ant kar denge (Sushmaji just said old age is a disease. I don’t think so, and even if it is we will end this)”, he said. Jaswant Singh today introduced an exit option in the new pension insurance scheme of the LIC after 15 years and a loan provision after three years. In such an event, the deposited amount will be returned in lump-sum to the policyholder. Apart from this, up to 75 per cent of the total deposited premium will be allowed in the form of a loan after the policy had run for three years. Talking to The Tribune here today, Mr P. Balendran, Vice-President, Corporate Affairs of the company, said General Motors viewed India as a big market and therefore after Korea company has launched its Luxury car Optra here. Mr Balendran was in the city regarding the launch of Optra that had been priced at Rs 7.95 lakh (ex-showroom, Ludhiana). By 2005, the company aims at seeing 50,000 General Motors cars on the Indian roads from the current 17,000. Rubbishing reports of GM re-launching Daewoo ‘Matiz’ as ‘Spark’, Mr Balendran said this was mere speculation. “We are working on some new products but due to competition in the auto sector, it is not possible to reveal our plans at this point”. However, Mr Balendran ruled out any price hike in the GM line of products. “Though steel prices have sky-rocketed, but we are able to offer cars at the existing prices due to in house purchase of all components from GM subsidiaries across the world”. Meanwhile, Mr Sanjeev Garg, Director, vehicle and part sales, General Motors India, said the company was working on other products, including diesel vehicles but the immediate aim was to consolidate the position of Optra in the market. The company has booked 400 Optras since its launch on July 6. The company plans to sell 7000 Optra cars throughout India till December this year. Out of this the northern market has a share of about 10 per cent. The company had already launched Corsa, Opal Swing and Corsa Sail during the last two years, he said. The onset of a good monsoon in most parts of the country is likely to trigger better fortunes for Punjab Tractors Ltd (PTL). The state government is hoping that with the expected increase in demand for tractors, prospective bidders may come forward with better price to take 23.4 per cent share of the Punjab State Industrial Development Corporation (PSIDC) in the company. The last date for submitting financial bids for prospective bidders is July 21. PTL, with 18 per cent market share, has been in news recently as the company has been put on the block by the state. Despite the drought last year which had adversely affected the sales volumes, the company registered Rs 62.2 crore profit before tax during the financial year ending March 31, 2003. The sales of tractors came down from 40,100 in 2001-02 to 24,200 in 2002-03. According to industry watchers, with reports of good rains in Gujarat, Rajasthan, Andhra Pradesh, Madhya Pradesh, Uttar Pradesh, Punjab and Haryana, the company’s tractor sales can increase by 15-20 per cent in the current fiscal year. The financial results of good sales can be reflected in the third quarter of the current financial year. The current share price of the company is hovering around Rs 165. The analysts say that despite the prevailing uncertainty due to continuing disinvestment process, the company has performed better than expected. Although the company registered Rs 143.5 crore profit before tax in the previous year, yet its competitors found themselves helpless before the onslaught of the drought. Only Mahindra & Mahindra, with about 30 per cent market share, could earn a decent profit before tax of Rs 26 crore in 2002-03 against Rs 25.3 crore earned during the last fiscal. Escorts suffered a loss of Rs 162.5 crore before tax during 2002-03 against Rs 17 crore loss suffered during the previous year. Eicher suffered a loss of Rs 10 crore, CASE New Holland incurred loss of Rs 26.1 crore ( calender year 2002) and L&T John Dear, new entrant in the market, suffered a loss of Rs 69.3 crore. The Bangalore centre, to be launched next month, will primarily focus on software development and Internet-based innovation. The centre planned to have 150 highly skilled software engineers by 2004, company officials said. Yahoo ! Software Development India Pvt Ltd’s CEO Venkat Panchapakesan and COO Bharat Vijay told a news conference here the new facility would work in tandem with the US R & D unit to keep up with the growing needs of the industry. To a question, Panchapakesan said for the Bangalore centre, the California-headquartered parent company had no plans to move jobs from the USA. “Recruitment will be made locally”, he said, adding that the company was already in the process of getting on board around 100 engineers. On setting up the centre here, he said India had a proven track record in software development, a vast English-speaking engineering talent pool. The move was also part of the company’s strategy to take a global approach in product innovation and support. It would work on development of highly scalable server technology, UNIX/C/C++, Server technologies, Middleware, TCP/IP networking, FreeBSD, Apache, Oracle/MySQL DB and Data Mining Algorithms, among others, Vijay said. The 84th meeting of the State Level Bankers’ Committee, Haryana was convened by Punjab National Bank, here today. Mr S.K. Awasthi, General Manager, PNB said the total deposits of the banks in the state increased from Rs 22,325 crores as in March 2002 to 24,592 crore in 2003, showing growth of 10.2 per cent as compared to growth of 15.7 per cent last year. Similarly, advances also increased from Rs 9,947 crore to Rs 11558 crore during the review period. Banks disbursed Rs 7,212.32 crore up to March, 2003, against the annual target of Rs 7,003.08 crore. The total income in the period under review also increased to Rs 717.19 crore (Rs 560.48 crore in Q1 of last year), the bank said in a release here today. The net interest income grew by Rs 96.6 crore to Rs 285 crore, driven by average asset growth of 29.7 per cent and improvement in the net interest margin, it said. As of June, 2003, the total deposit base was Rs 23,340 crore, registering an increase of 32.6 per cent over Rs 17,602 crore in Q1 of last fiscal, it added. In the Q1 of FY-04, the retail accounts increased by 30 per cent from 25 lakh to 33 lakh. Retail loans grew by 132.9 per cent to Rs 3,790 crore and now form 30.8 per cent of gross advances, it said. The net non-performing assets of the bank was less than 0.3 per cent of customer assets and the capital adequacy ratio was pegged at 11.79 per cent. Mastek group has recorded a 22 per cent rise in the net profit at Rs 50.5 crore for the year ended June 30, 2003, compared to Rs 41.4 crore posted previous year. The total income in the period under review also rose by 30 per cent at Rs 380.2 crore as against Rs 292.6 crore registered in last year, Mastek said in a release here today. For the fourth quarter ended June, the net profit, however, declined by 85.29 per cent at Rs 3 crore (20.4 crore in Q4 of last year). This includes Rs 1.5 crore of expenses incurred on its business process outsourcing operations, it said adding, the total income increased to Rs 92.1 crore (Rs 90.1 crore). Referring to the outlook for 2004, Mastek said it expects the consolidated group income to grow to Rs 460 crore while the net profit would be Rs 35 crore. Murdoch-controlled News Corporation along with persons acting in concert (PAC) is making an open offer to acquire 20 per cent equity from public shareholders of Delhi-based Hughes Software Systems Ltd (HSS) at Rs 232 per share. Reliance Energy Ltd and Tata Power had said in their status report that power supply to the national capital was more than required and the excess was being provided to Punjab. Mumbai: The State Bank of India (SBI) plans to raise around $ 1.5 to 2 billion by way of a new deposit scheme targeted at Indian expatriates, including the Resurgent India Bonds (RIB) holders. New Delhi: Ranbaxy Laboratories Limited (RLL) has received tentative approval from the US Food and Drug Administration (FDA) for manufacturing and marketing anti-fungal Fluconazole for Oral Suspension. The nod is for 10 mg/ml and 40 mg/ml to the reference listed drug Diflucan for Oral Suspension of Pfizer Central Research, RLL said in a statement here today. New Delhi: Infosys Technologies Ltd today got a major relief as the Delhi High Court restrained a lesser known computer company from infringing its corporate name “Infosys” to carry out its day-to-day business.